Hey, everyone! 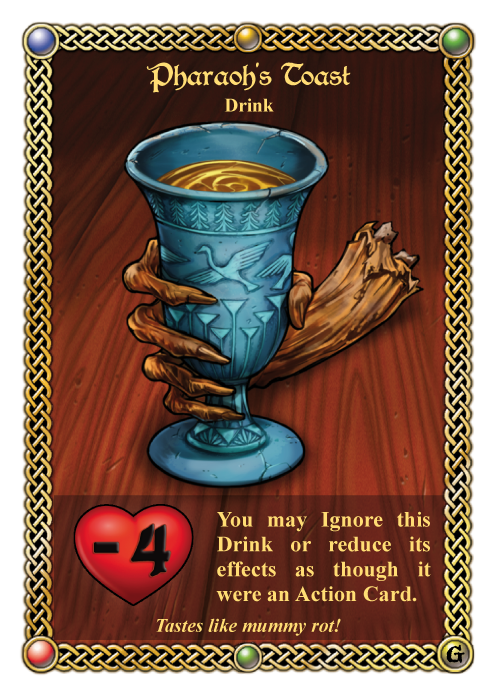 Gen Con is coming up, and with it, we’re revealing a new Red Dragon Inn promo drink! In honor of the upcoming release of our dungeon-delving goblin siblings, Keet and Nitrel, we thought it would be good to have a drink that looks like it came straight from a dungeon’s loot. Presenting…. Pharaoh’s Toast. To get this card, purchase any item from our booth at Gen Con (booth #1849). May we suggest Keet and Nitrel? And for those of you who won’t be attending Gen Con, don’t worry – Pharoah’s Toast will very likely be available through other channels in the future. Stay tuned!